The Berlin File is getting rave reviews from the American press. 'The New York Times' said in its February 14th edition that the film "takes flight with its exhilarating action set pieces." adding that director RYOO Seung-wan "brings his brand of muscular action and quicksilver agility to the shifting battleground of international espionage." U.S. news agency 'Bloomberg' also praised it and gave it four stars out of five, saying, "the film offers just about all you could ask of a genre flick; poisoning, defections, a secret North Korean bank account, gloriously choreographed fights that go insanely over the top, febrile tension and doomy romance." 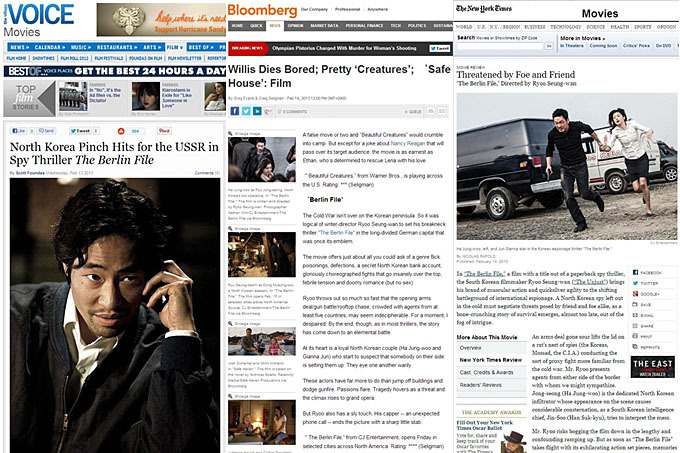 American tabloid newspaper 'Village Voice' said, "the enjoyable analog antics end with one character boarding the train bound for Vladivostok, but judging from the evidence, it's Hollywood where we can expect to see RYOO Seung-wan appear before long. 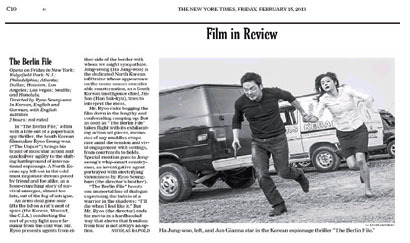 Also, 'The Hollywood Reporter' praised the film saying, "with an A-team cast taking the primary roles, including RYOO's brother and regular collaborator RYOO Seung-bum, and featuring the return of Swiri's HAN Suk-kyu along with international star JUN Ji-hyun, The Berlin File crackles with tense character conflict." The Berlin File opened in 21 North American cities on February 15th including Los Angeles, Las Vegas, Chicago, New York, Vancouver, Toronto and Montreal.